Systembitz Technologies as the name implies is an IT equipment, installation and maintenance company with remarkable excellent rating. One of the best reliable IT firm around for your school, organization and company's IT equipment and maintenance. 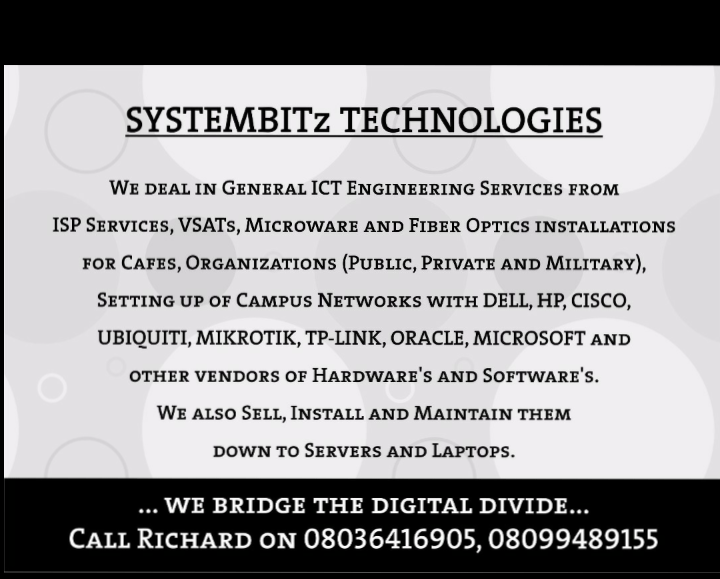 Systembitz have been bridging the digital divide for several organizations, firm, home and school for more than 4 years now in the heart of Nasarawa, North Central Nigeria. Systembitz deal in general ICT engineering services such as; ISP services, VSATs, Microwave and Fibre Optics installation, cyber cafe system networking and routing, ICT centre setup, Security devices setup for private, public and military organizations, setting up of campus network using recent hardware and software from providers such as HP, Nexus, Dell, Oracle, Microsoft, CISCO etc. They have been working for Federal Polytechnic Nasarawa for years now as digital ICT center contractor, and previous works include; iTech Development Hub routing and server setup, many secondary school's computer room setup, private residential houses and estates etc. Also if you're in Nasarawa state, you can visit the Federal Polytechnic, the ICT lab or visit 11 first floor by oversea junction plaza opposite Nasarawa market, Nasarawa.